Watching the efforts to stop Donald Trump run through the primaries to the convention this week, I was reminded of the Our Gang “He-Man Woman Haters Club” where Spanky and his friends embark on a futile effort to keep the members from ever falling in love with a girl. While no candidate has yet received the 1237 delegates that the rules provide as a necessary predicate to the nomination, Trump is closest to that goal. He has won 19 of the primaries to Cruz’ 8. He has 678 delegates to Cruz’ 423. The He-Man gang which ignored the tea party and the left’s baseless attacks on it, and the mounting evidence of voter dissatisfaction with open borders and one-sided trade deals (and lax enforcement of them) has been working overtime to stop its base from falling for Trump. Seems it’s a bit late for that. Romney gave it a try and in the process seems only to have diminished his reputation. In Ohio he endorsed the likely (and eventual) winner John Kasich last week. This week he said he was voting for Cruz in Utah, though he didn’t outright endorse him. Needless to say, Kasich expressed his displeasure at this obvious sign that he was Romney’s pawn to get a brokered convention. Several scenarios have been floated besides keeping Kasich in as a spoiler, including ignoring the rules or just freeing the delegates to vote for another candidate. This week, there was a not very secret meeting by the anti-Trump club. Days after disavowing what he described as Republican attempts to “Jim Crow” Donald Trump supporters at the Republican National Convention this summer, right-wing radio host Erick Erickson became the de-facto spokesperson for the newly formed “Conservatives Against Trump” group -- earning a torrent of backlash from his fellow conservatives. Just days ago, however, the recently outspoken Trump critic still appeared to be biting his tongue a bit when he dismissed rumblings of a contentious convention fight. “Beat Trump at the ballot box, not the convention,” Erickson insisted earlier this month. 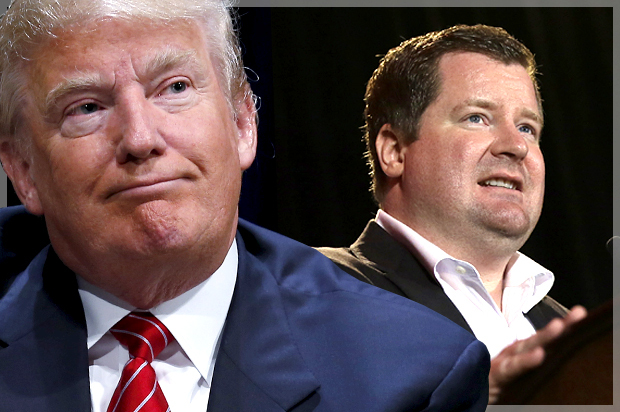 Erickson explained to the Atlanta Journal Constitution this week that his change of heart was spurred on by high levels of Republicans indicating they would not support Trump in the general election, according to exit polls in primary states that have voted thus far…. In fact, Donald Trump was in on the ground floor of the most significant political victory American conservatives have won in this century; the election of Ronald Reagan as President of the United States. I know because I was charged with organizing former Governor Ronald Reagan's campaign in New York State, as well as New Jersey and Connecticut. To a man, the New York business establishment and significant Republican contributors were supporting either Ambassador George H.W Bush or former Texas Governor John Connolly for President. Well heeled Reagan donors with the ability to raise significant funds for Reagan were hard to come by in the Northeast. Donald Trump is among the handful who really stepped up to the plate for Reagan. Trump made arrangements for the Reagan campaign to obtain campaign office space on West 52nd street and raised over a quarter million dollars (in 1980 dollars) for the Reagan campaign coffers. Trump also set up meetings with numerous private sector union officials he was friendly with, and encouraged a number of them to bolt from Jimmy Carter and endorse Reagan. “I think it’s pretty simple. If you want to help elect Hillary Clinton, and you want to make sure that the unionized bureaucracies are totally in control, and you want to have a radical Supreme Court to finish eliminating our liberties, then play games like this. But that’s what they are: They’re games,” Gingrich tells Breitbart News Executive Chairman and SiriusXM host Stephen K. Bannon on Breitbart News Daily. Certainly some of the Not Trump crowd is influenced by polls indicating he cannot beat Hillary, but the general election is a long way down the road and there seems little sign of Trump’s popularity diminishing. His unconventional on-the-cheap campaign gave us a taste this week of how he plans to do it. Putting together a 15-second video that he posted on Instagram, he very successfully ridiculed her assertion that she is up to the demands of the presidency and it was widely published for free. Compare and contrast with the millions of donor dollars the anti-Trump crowd wasted on ads produced and placed by highly compensated consultants which no one watched or heeded. In any event, Hillary’s troubles seem far from over. It’s true the indictment in 60 days that former federal prosecutor Joe di Genova predicted in January has not yet come to pass, but he remains confident that a grand jury to investigate her conduct is ongoing and the intelligence community will not stand for it if she is not prosecuted. Considering everything, trying to deny Trump the nomination after this week’s results based on the notion that he cannot beat her in the general election seems about as foolhardy as betting that Hillary would beat Sanders in Michigan. Remember, not a single poll in the month preceding the election had her winning by less than 5 percentage points and many had her beating him by 20 or more.